You know how all your photos have a ton of extras tucked inside? Like – to pick a completely random example – the GPS data. And yet, whenever you send your vacation photos to your mom, she mails back to ask “where is that cool restaurant with the camel and the statue of Elvis outside?” or somesuch thing. Of course, you want to scream “Just look in the EXIF data, you idiot!” but, bring a good son/daughter, you just tell her. Again. Well, a new app for the iPad and iPhone will help you make the implicit explicit. It’s called Map Camera. Map Camera adds – surprise! 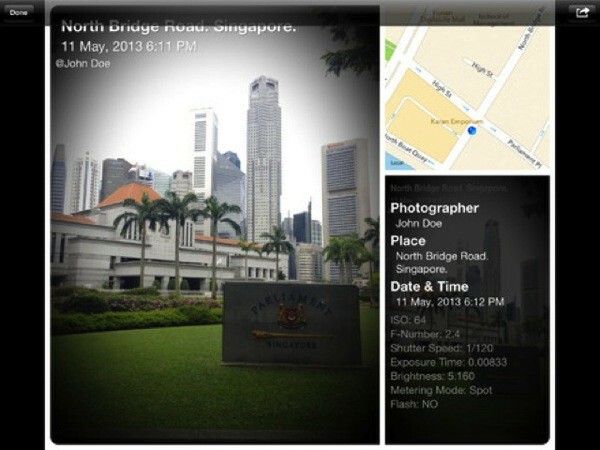 – maps to your photos, either as you take them or afterwards. You can have it add the map itself or just a timestamp and location. And if you export photos they retain all EXIF data, unlike exporting from some apps I could mention (cough iPhone cough). And it’s not just good for vacation photos. Want to invite somebody to a soirée at your home or office? Snap a picture with Map Camera and you have a ready-made invite. The app is available now for a mere $2. It’s worth that just so you never get another location question from your mother.